A COLORFUL first person adventure game that combines action, negotiation and ROGUE-LITE ELEMENTS! Progress through the levels and the story, choose your path, but above all, recruit allies. All the strange characters you meet in game can be played in first person, and it’s up to you to find the right answers to get them to join your team! Idiotic workmen, MYSTERY FROM OUTER SPACE, ODDBALL FRIENDS, AND FAST COMBATS AWAIT! Post news Report RSS	AWAY is now available on Nintendo Switch! AWAY is available on PS4 & Nintendo Switch! Coming on February 8th on Xbox One and February 13th on PC! This is it! 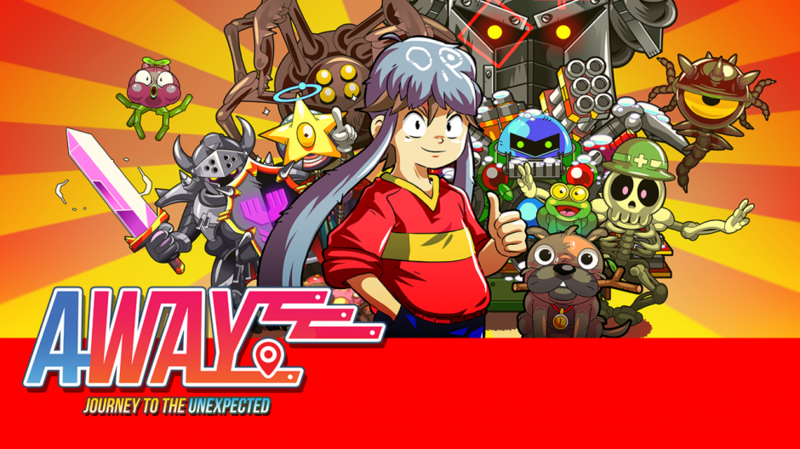 AWAY: Journey to the Unexpected is now available on Nintendo Switch eshop! Watch our launch trailer! Time to make friends & save your village! The next release is the Xbox One version that'll come on February 8th & PC release on February 13th!